Mr. Sunday is Pet of the Week! You are here: Home / Pet Corner / Mr. Sunday is Pet of the Week! 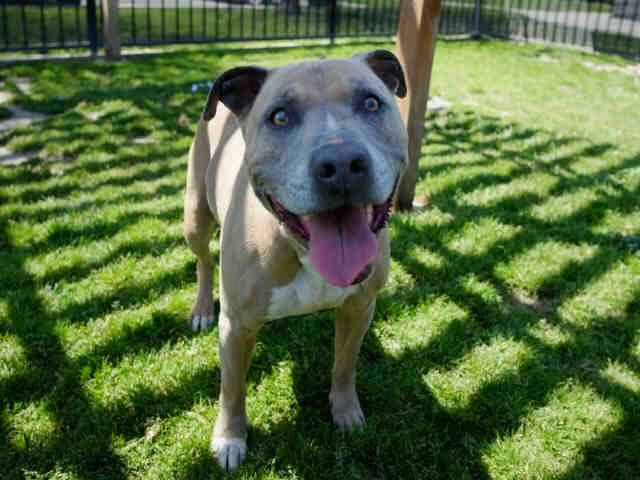 Mr. Sunday is a sweet, playful pit bull/German shepherd mix, about 8 years old. Mr. Sunday was found on the street, wearing a dirty worn-out collar that had his name on it, but that’s all we knew about him, and no one came to claim him. Because we consider him a senior, his adoption fee is only $20! If he gets the home he deserves, Mr.Sunday will never be the same—and we mean that in the best possible way! Meet him on the shelter side of the Companion Animal Village at 7700 East Spring St., (562) 570-PETS. Ask for ID#A585708.